The scroll saw is a woodworking tool used in making delicate designs on wood pieces. Moving up and down the piece, the scroll saw is able to deliver excellent results both for commercial and DIY purposes. Despite the widespread use of scroll saws, questions like ‘what does a scroll saw do?’ or ‘how does a scroll saw work?’ are still important. We shall be providing the answer to this in the discussion by looking at the components of a scroll saw and how it works. The scroll saw is made up of different components all of which carry out different function to produce an excellent sawing result. While these parts can be understood individually, it is important to know that they are all function together. The Table: The table of a scroll saw is that part that provides a surface upon which the user slides the wooden boards. It comes with a lot of space making it very easy for you to make use of the scroll saw. The Tilt Lock Knob: Adjustment to the table can only be made possible with the aid of the tilt lock knob. With these adjustments, miter cuts can be effected on small pieces of wood. The Blade: The blade is the part of the scroll saw that does the cutting. They come in various types, sizes, and quality attributes with some replaceable options. The Speed Dial: The speed dial is a variable one that allows for adjustment of the blade. You can either make the blade of the scroll saw go faster or slower with the speed dial. The Blade Tension Knob: A replaced scroll saw blade requires that the blade tension is tightened for effective functioning. The Dust Blower: The scroll saw comes with a dust blower that makes working on the surface very easily. As you work, the dust blower takes dust away from the surface of the wood piece. The Blade Guard: The table guard helps in making sure that your fingers are shielded from coming in contact with the blade while in use. The Blade Clamps: Considering how delicate the blade is, it needs to be held in its place. This is made possible with the blade clamps which is located on the top and bottom of the table. The Power On/Off Switch: This is self-explanatory as it is responsible for putting the scroll saw on for use and off after use. Make sure to put the power off when the scroll saw is not in use. The working principle of a scroll saw is very simple and basic. The first step to knowing how to use the scroll saw is to understand its basic parts provided for above. When you know the various parts and their uses, making use of the scroll saw becomes very easy. Now, let us discuss the operational features and uses of the scroll saw. The operational modes of a scroll saw depends on the type of scroll saw used on one hand, and the work to be done on the other. However, irrespective of these differences, there are a number of operational modes that are uniform across the various types of scroll saws and work that is to be done. First is that you have to make sure all power cables and auxiliary cords are well fitted, well covered and secured in their place before you go on to power the scroll saw. When in place, put on the switch and leave the scroll for a while to have it warm up. Scroll saws especially the ones made available in recent times have variable speed dials. This makes it easy to decide the cutting speed which is based on the nature of the wood or the work is done. The average cutting speed for the scroll saw should be at around 400-1600 rpm, but this can vary from work to work. To change the speed, you will have to adjust the speed dial to either increase it or decrease it. When increased, the scroll saw makes a really fast cut and works best with woods that are soft in nature. On the contrary, the scroll saw will need to have it’s cutting speed reduced if you are working on hardwoods to avoid making wrong cuts and the stress of corrections. The distance between the blade and the back of the scroll is what is known as the depth of the throat. This distance varies depending on the work that is done and the type of cut to be affected. The interesting thing is that this distance can be increased or decrease to make cutting very easy for you. To increase or decrease this distance, you have to loosen the throat to increase or decrease the depth before fastening it back in place. The blade adjustment setting is a very important feature to look out for in a scroll saw. It is very necessary for the blades to be easily removed and replaceable. The type of scroll saw or the blade that comes with it has a different blade adjustment setting. For example, if you have a tooled blade, a tool will be needed to adjust the blade. A pin end and plain end blade come with a release that makes adjustments very easy. The frame/table support gives the table all the support needed to not only stand firm but stay smooth for effective work to be done. While some scroll saw comes with a frame and table support on purchase others something. It is still very possible to make use of old wood and scraps to provide support for the workpiece while effecting your cuts. Whatever support is provided for the table/ frame, it should be well fastened to the table in a way that it doesn’t affect work done on it. It shouldn’t also cause discomfort to the user as well. As you use a scroll saw, you may need to make adjustments to some parts of the scroll system depending on the nature of the wood or the work that is done. Some hi-tech models allow users to enjoy more adjustability and control features than others. The blades, table, and throat are parts of the scroll saw that needs timely adjustments. While the table can be adjusted with the tilt lock knob; the blade tension can be reduced or increased with the use of the blade tension knob. Adjustability and control are two very important features to look out for in a scroll saw as it makes working with one very easy. The dust cleaning system is also an operational feature to take note of. While working with the scroll saw, saw dust are likely to accumulate on the pattern. It is necessary for the scroll saw to be able to take this dust away so as to ensure the accuracy of work. With the dust blower, you can blow the dust off the pattern and piece as you go on with your work. After a while, you notice that the dust has accumulated, blow with the blow duster. Set your scroll saw in a place that dust blown away from workpiece do not interfere with other pieces in the workshop or you as the user while working. While using a scroll saw, you need to have awareness to a certain level to ensure that no harms are about to occur to you. Keep the scroll saw in a safe locker room until it is needed is best. Wear protective gloves and face masks while sawing. When making use of a scroll saw, make sure that you have all your protective wears on to avoid dust, dirt and grimes from coming in contact with delicate parts of your body. Learning about the parts of a scroll saw and how a scroll saw works can be very helpful in making the most of it. 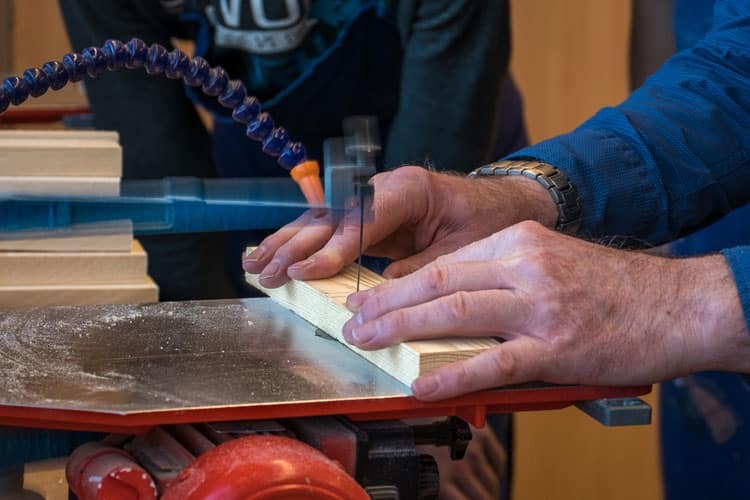 The question ‘what does a scroll saw do?’ can only be best answered when you not only have a piece of knowledge about the saw, but also its safety precautions. The scroll saw is as effective in wood and metal work as it can be harmful. Make sure to stay safe when making use of one. 4 Why and How Are Drill Presses Measured Before Using for a Job? 9 How to Remove Chuck from Drill Press for a Safe Replacement?